People across Scotland are playing their part in tackling climate change, now it's time for our politicians to step up. I’ve spent the last month travelling around Scotland, meeting people in different communities to talk about climate change, Scotland’s new climate law, and how we can make a difference. 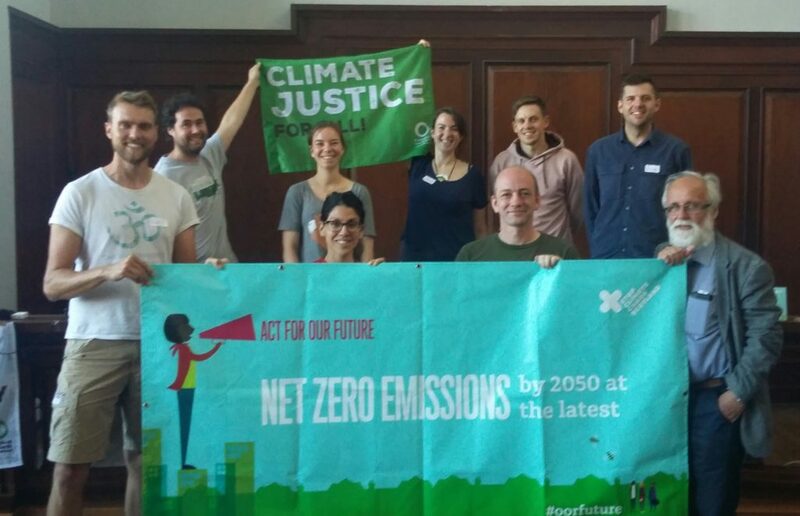 Together with Stop Climate Chaos Scotland and Take One Action Film Festival we ran 14 climate action workshops and 10 film screenings of the fantastic documentary Not Without Us, meeting hundreds of people from the Borders to the Highlands! It was inspiring to see so many people, young and old, experienced campaigners and new, coming together for a common purpose. Some came to learn more about climate change, some came to find out about the new climate law, but all came together to make a difference. I was genuinely heartened by all the people we met who are giving up their free time to get active in their community trying to change things for the better – from people involved in community wind power projects in the borders to those who’d been fighting fracking in the central belt, from a local church carbon saving project in Dundee to medical students in Aberdeen making the link between climate and health. 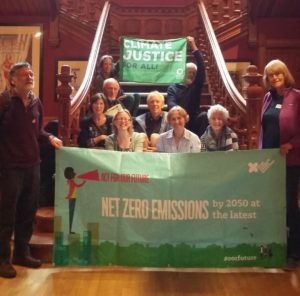 At a community level, there were growing and gardening groups in Glasgow, cycling campaigns in Inverness and upcycling projects in Edinburgh, to local ‘climate cafes’ in Perthshire who meet regularly to talk about climate action over a cup of tea. We met people who had marched on the streets of Paris at the time of the 2015 UN climate conference and want to see Scotland play our part in delivering the Paris Agreement now. This whole experience cemented something that I already knew to be true – that people in Scotland really care about climate change and want to play their part in solving this crisis. This wonderful patchwork of activities show that people get involved in ways that they value and enjoy. Part of my job as a campaigner is to try and harness that positive, transformative energy and ensure we steer it where it can have most impact. So, as our politicians decide what to do about Scotland’s new climate laws, it’s time for us all to come together and show our collective support for climate action and our demand for climate justice. This new law will define our climate ambition for decades to come. Its top-level targets will filter down and affect choices that shape our food and transport systems, how we warm our homes and where we get our energy from. Politicians often make the excuse that the public don’t care about these things. We know they’re wrong. But we need to tell them loud and clear. So let’s show our MSPs that all across the country, the people of Scotland are more than playing their part in tackling climate change, now it’s their turn to step up and deliver a strong climate law. By coming together and pushing for action at the national level we can end Scotland’s contribution to climate change. If you haven’t already asked your MSP to help end Scotland’s contribution to climate change, please take 2 mins to do so now.